In the spa Waterfalls Tamasopo tranquility prevails as unique places for beautiful nature, which have not been invaded. The waterfalls are preserved in their natural form. The hand of man has changed to a small extent the freshness and simplicity of space. There is only a small restaurant, with rather homemade food. meters high and watch the water table uniform top, be divided into sections that slide over the rocks. In some parts of the segments they are wide and as thin as other silver threads. Light plays a great role. Waterfalls produces reflections in snow making them look curtains with multiple undulations. In parts where light does not benefit from its brightness, shadows that give depth and highlight it lit up like small suns that dazzle us are created. The color of the water is noteworthy. On the banks it has pale green hues that are gradually acquiring acuarelosos blue turquoise shades to predominate. Transparency is unprecedented. It seems dive to see if we see our body sliding into the sea of ​​tonal ranges. The deep parts of the pool are easy to spot because they acquire a deep blue dye. The three waterfalls coincide more or less in height but not in form, in the fall and in the channel that carries water. The longest is the first. 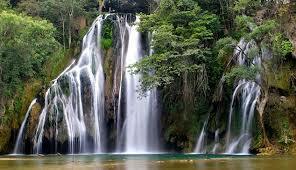 It is divided into two falls about fifteen meters each. Water seems to slip between the rocks, divided into some sections, try different paths, to finally join again. The second, however, is narrower and collapses with a crash. It seems that the water reaches the precipice and, instead of running off the sides, throws hard for him. A pool of still water gets joyful to waterfalls that give life. Due to the clarity of the water, on the banks of the pond small rocks that provide a glimpse gritty tone. The turquoise speaks of the absence of rocks and deep, which is about five meters. In between rainfall, located a few meters from one another, a small blast its way through cracks in the rocks, through the undergrowth. It seems a drop of water independent and not a fork. As a trickle of water that separates the set in search of independence, it is introduced by the most difficult paths and manages its own character that delights the pupil. A kind of passageway leads us to an almost circular pond welcomes the third waterfall. This is avalanza flocked by large rocks to form a uniform mass of water that joins the intense turquoise blue that dominates the pool. Its deepest seven meters, encourages divers to perform somersaults on the trampoline cement. The sturdy tree branch holds a rope from which you can jump to fall into the warm water. The river that feeds is the "Tamasopo, which gets its name for being in the city. Later he joins the river Damian Carmona and the Gallinas River, which rushes from 105 meters high in a unique waterfall, known as form Tamil waterfall, whose waters feed the river Tampaón. Cleaning the spa is to be admired. For several years there is a manager who kept spotless. The site is ideal for camping and enjoy a relaxing holiday. it has an area of ​​half a hectare camp with fruit trees for shade. The entrance fee of five dollars per person per day. Many stoves facilitate food preparation, giving them an exquisite flavor. The site is fenced to provide security. To reach the waterfalls Tamasopo from Mexico City, take the No. road. 70. A 55 km from Ciudad Valles, San Luis Potosi 205 to Tamasopo deviation is located. Seven kilometers lead us to town. The resort is located just two of Tamasopo. The road, everything pavement, preserved in perfect condition. You can camp on site or stay at Tamasopo, population with a good hotel and an inn.